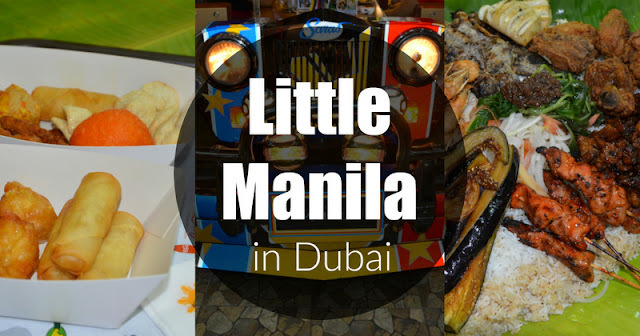 Little Manila captured everyone's attention when it opened in Deira last year. I was also drawn to it, but I somehow lost my interest when I saw photos of the queue outside the restaurant during its first opening week. I waited for the hype to die down, but came a downpour of negative reviews. So, I waited again. Now, it has been a year since Little Manila opened its doors. Most of my friends have already been there, and lately, the feedback has been good. So, a few weeks ago, I finally found myself walking in the lively Muraqqabat Road, searching for Little Manila, hoping not to be disappointed. I adored Little Manila the moment I saw its facade! There's a classic jeepney parked outside the entrance and the restaurant looks pretty decent. I couldn't help but feel giddy and be extra-proud to be Pinoy to see all these in a busy street of Dubai! Little Manila has a festive touch that made me think of local fiestas. A warm "Mabuhay" greeting welcomed us, and we instantly felt at home! The colorful dining hall is lined with food stalls selling all kinds of Filipino food; from street eats to classic dishes. I expected nothing less than true Filipino hospitality, and I'm glad that it's what I received at Little Manila. When I hopped from one food stall to another, I was greeted with smiles along with courteous invitations to try the dishes they offer. Little Manila is a Filipino-themed food court with 8 well-loved Filipino brands. It is the first of its kind in the UAE; hence, I wasn't surprised to see the place jam-packed on a weekday night. During our first visit, we tried 3 out of the 8 food outlets. We kick started our dinner with Kwekie Bites' Street Food Mixed. It's perfect, because where else should we begin our gastronomic journey than in the streets of Manila! The street food mixed is a sharing platter of our beloved Pinoy street food: kikiam, kwek kwek, siomai, fishballs, spring rolls! All were golden fried, served hot, and with 6 types of dips to choose from. Little Manila became famous for its boodle fight. So, for my first dining experience, I opted to try the best selling Kalayaan Boodle from Jay-J's Inasal. It is an incredible Filipino feast challenge for 4 to 6 people; a complete package of Chicken Barbecue, Beef Belly Barbecue, Fried Chicken, Grilled Squid, Fried Tilapia, Crispy Shrimps, Fried Eggplant, Kangkong with Bagoong, Ensaladang Mangga and a hefty serving of rice! All were scrumptiously arranged on a banana leaf. But wait! It doesn't end there! Kalayaan Boodle Fight also comes with Kare-Kare and Bulalo, Red Iced Tea, and watermelon slices. When the fight (I mean the feast) started, all four of us gushed over the beef belly barbecue because of its resemblance to pork liempo which we all miss! The tender meat is well-marinated and smothered with sweet barbecue sauce. My next fave is the grilled squid. It is cooked perfectly - tasteful and tender, not rubbery! Third, uhhmm it's actually hard to choose for a third fave because the rest were okay, but if I have to, it's the crispy shrimps! It is crunchy, lightly coated with batter that complements and not overpower the shrimp's delicate flavor. Every dining experience at Little Manila must not end without the Ensaymada from Bread Shop. Made fresh daily with fine ingredients, the Bread Shop made the Filipino sweet pastry extra-special. It is cheesy, creamy and fluffy. The best ensaymada I've had by far! I'm happy to say that I wasn't disappointed, and that first visit wouldn't be the last. Little Manila is a little Manila in every sense of the word! This Filipino restaurant in Deira is tiny a piece of the Philippines' capital. It is a bustling space filled with authentic flavors that can bring us back to the arms of Manila in an instant. For updates and current promotions, visit Little Manila's Facebook Page. We were invited to dine at Little Manila. Opinions in this blog post are my own.